Carrot cake for breakfast? Why yes! 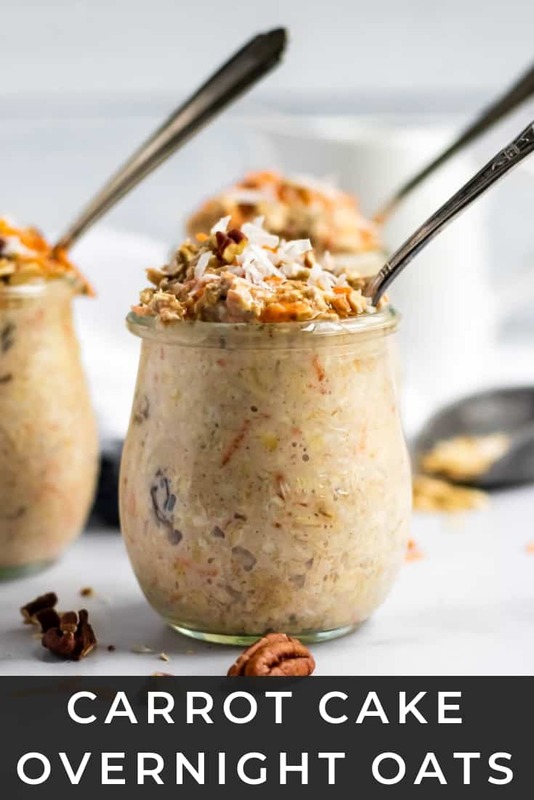 These Carrot Cake Overnight Oats are a simple, hearty way to start your morning. 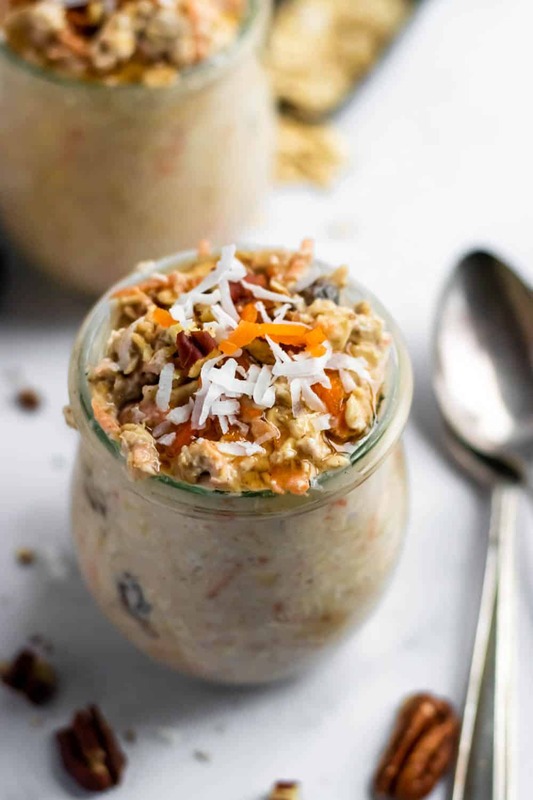 Prep your oats at night and breakfast is ready on the go. So easy! It’s another snowy day here in Ohio. It’s as though the entire season of winter has been crammed into this one week. This is really messing with my routine and I am starting to get some major cabin fever. However, I had quite a bit of time in the kitchen so I am actually behind on recipe sharing. Guessing that’s a good thing! I love the feeling of routine, consistency and predictability. I like to have my day set out before me and know what to expect. So you can imagine that after a few days of non-routine how I start to react. Clearly, this is another part of my need for control and another work in progress, but a week of snow is just not helping. Sitting on the couch all day or binge watching my favorite TV show is more of a nightmare to me than a holiday as my husband seems to think. I’ve gotta be moving and feeling like I am accomplishing something each day. And I have learned this week that there is only so much laundry to be done or closets to be cleaned. Needless to say, I am ready for spring! Since I have had so much extra time in the kitchen, I have had more successes than failures with new recipes. Only one was a major flop so I am pretty pleased with the things I have to share right now! 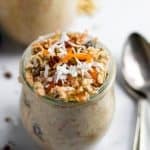 I have quite a few recipes for overnight oats and yet lately I have been wanting a smoothie each morning for breakfast even though I have a delicious breakfast already waiting and ready. Since I haven’t really been in any kind of rush, a grab and go breakfast is not really necessary. 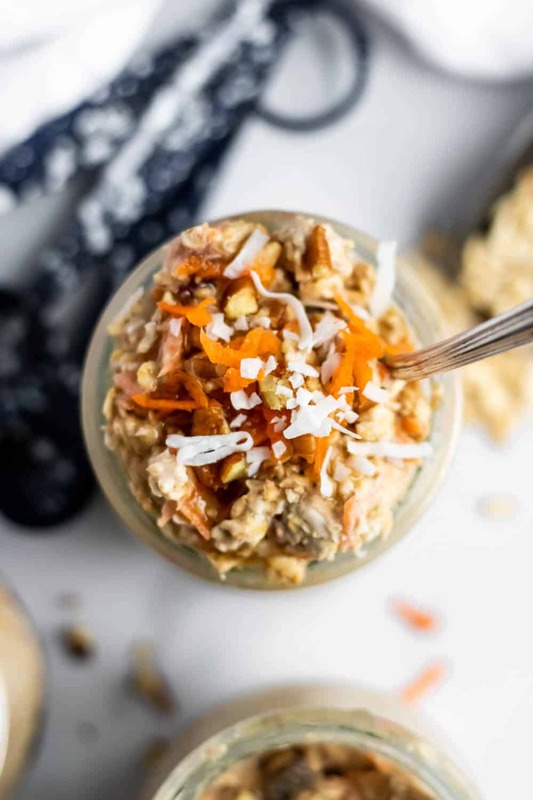 So I have been having these oats as an afternoon snack and it has been amazing! Carrot cake is one of my absolute favorites. The combination of flavors is right up my alley. This Carrot Cake Overnight Oats recipe is an easy way to sneak in some veggies for breakfast. And if you tell the kids they are eating cake, then who could say no to that! Remember that these can be eaten hot or cold. Feel free to use any kind of milk. I typically use unsweetened almond milk. 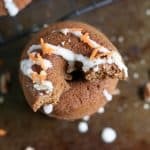 This can easily be made gluten free as well! Combine all ingredients in a container that can be sealed and stir well. If you plan to eat this cold, you may want to put the raisins in right before serving or they may be too hard straight from the refrigerator. Because the zucchini bread overnight oatmeal was so fabulous, I plan to make this one next. I have printed nearly every overnight oatmeal recipe in here! I would love to see Lorie put together a Cherry Almond overnight oatmeal using almond extract. It would be awesome!! I trust Lorie’s taste in spices. 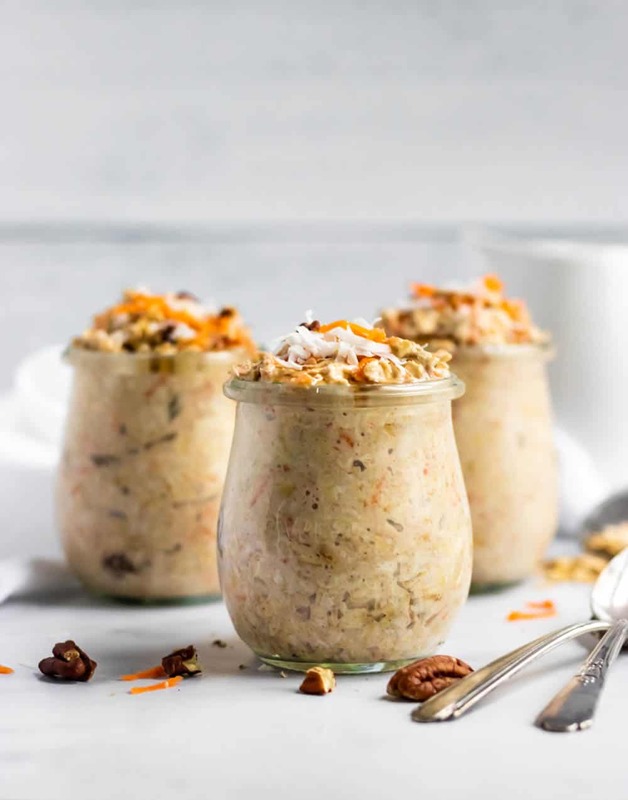 I actually can’t decide between this one and the Banana Bread overnight oats for my favorite. Cherry Almnod? I will get to work on that one. I am always happy to take requests! I had this wonderful oatmeal this morning. Lorie gives us the choice of Steel-cut oats or Rolled oats. I chose the steel-cut, but next time I will use the rolled oats. I really do prefer those in my cold overnight oatmeals. Spices are perfect and this will easily become a staple in my home. I am sending Lorie’s recipes for this to all my cooking friends. Cathy, you are too sweet! I agree with you, rolled oats are my preference. Thanks so much for sharing and I’m so glad you liked the recipe!! What do you mean by maple? Like maple syrup? Hey there! Yes, maple syrup. Sorry about the confusion! Do you not cook this at all? Don’t the oats need to be cooked first? Hi Ginnie! The soaking overnight is essentially the secret to this. It’s sort of the “cooking” I guess you could say as the oats soften and absorb the liquid. You can still heat it up just a tad in the morning though! Hi Lacey! I don’t count calories as it was once an obsession of mine so I don’t collect the nutrition info on my recipes. However, it is really easy to just copy and paste the ingredients into a counter and get it all! Thanks! I plugged it in to see about the sugar content. I omitted the raisins and flax but added about 1T of cream cheese. I mixed warm almond milk with the cream cheese and maple syrup and then heated it through. Because carrot cake must have cream cheese, right? It was delicious. As far as healthy? Not bad on the sugar, really high in carbs, could stand to have some protein powder added if I was really inclined. But sometimes, you just want to have the carrot cake oatmeal and a cup of tea. Just finished making this recipe. No flax seeds so substituted with chia seeds. Can’t wait to hace some “cake” for breakfast!!! Chia seeds will be great as well! You may need to add just a bit more milk in the morning as the chia may absorb more of it. Cake for breakfast is always a win for me! This is so good to hear, Marco. I am also carrot cake obsessed. And breakfast obsessed. So I gladly take over breakfast duties around our house as well. Thanks so much for sharing and have a great day! I left out the nuts because my son is allergic, but it was absolutely delicious! I can’t wait to make this again, everyone in my family loved it! Made these all week. Delicious hot and cold. 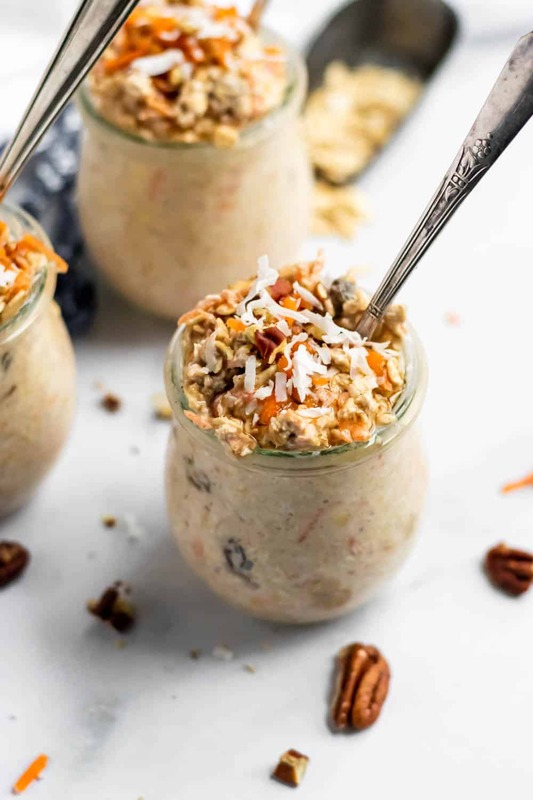 Might be my favorite overnight oat recipe yet!